Carl Spitzweg, who was born in Unterpfaffenhofen on February 5, 1808, was a very important figure during the Biedermeier period. 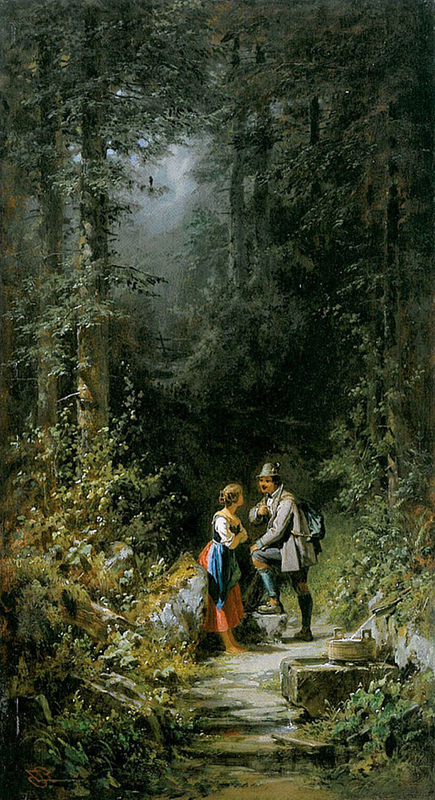 He was a German Romantic painter, with many of his works dealing with genre themes. Born into a wealthy family, Spitzweg trained as a pharmacist at the University of Munich. He fell ill and during recuperation, he picked up painting as a hobby, teaching himself to paint by copying the works of several Flemish artists and Dutch Realist School of Genre Painting masters. He contributed many drawings and illustrations to several periodicals and magazines featuring satires. He devoted himself to painting when he received his inheritance at age 25. A trip to Europe, going to the art centers in Belgium, London, Paris, Venice and Prague allowed him to study the works of several other artists and he was able to refine his style and technique. He was more prone to the humorous genre, as exemplified by his later drawings and paintings, many of them showing eccentricities that were sharply defined, such as in his 1865 work, “The Hypochondriac” and “The Bookworm” that he did 15 years earlier. The musical comedy by Edmund Nick titled “Das kleine Hofkonzert” was inspired by his paintings. One of his etchings called “Playing Piano” was among the Nazi loot that was found in 2012. Spitzweg created many small-format genre work, depicting daily life in the city, particularly the lives of the bourgeoisie, as they whiled away their time in city squares and streets, often including anecdotal details, which showed that he was a keen observer. Often, his paintings showed a sense of sympathy and humor, as well as sharp psychological insight, artistically depicted in basic compositions with subtle lighting that were reminiscent of the works of Dutch painters of the 17th century. Several of his genre works showed the Biedermeier style, which placed value on domesticity, comfort and stability rather than touching on political and social issues. Spitzweg’s works showed his preference for happy scenes from everyday life instead of images that evoked dramatic inspiration. His paintings showed charm, revealing that he happily observed the scenes before him, without any satire or criticism. He likewise had a predilection to characters with quaint and odd behaviors. 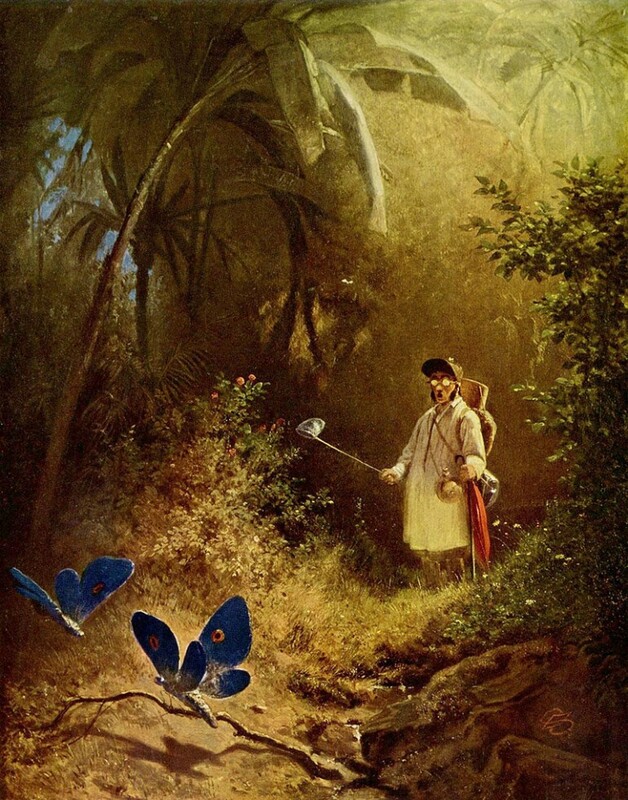 Carl Spitzweg also created several landscapes, preferring to use the en plein air method, with a palette of happy colors and a canvas with bold compositions. His landscapes showed the influence of several French artists from the Barbizon School, particularly Narcisse Diaz de la Pena, as well as the works of John Constable, Eugene Delacroix and Richard Parkes Bonington. He was able to study their works in 1849 when he was on his study trip to Paris and London. He was attracted to the sophisticated tradition of English landscape painting and soon started to study the plein air paintings of Theodore Rousseau and Camille Corot. Their influence showed in his later works that employed paint to create a particular mood or appearance and less of the narrative-dependency.